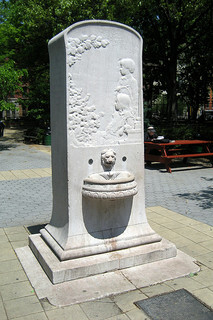 This memorial in Tompkins Square Park pays tribute to the lost children of the General Slocum. Until the events of September 11th, the sinking of the General Slocum was the responsible for the largest loss of life in New York City. The tragedy forever changed the composition of the Lower East Side. Yet, a 111 years later, it has largely receded from city memory. On June 15, 1904 (oddly enough, a Wednesday), St. Mark’s Evangelical Church chartered a boat, the General Slocum, to take 1358 members of its German-American congregation for a fun-filled day on the water and on a Long Island beach. For the kids, this was a day to look forward, and chance to breathe the fresh air and play outside, away from the dirty tenement scene in turn-of-the-century LES. The General Slocum was not a well-kept ship, to say the least, and the crew was badly inexperienced, especially at handling emergencies. Not far from shore, a fire burst out, and quickly consumed the ship. The combination of faulty lifeboats and life jackets, a panicked crowd of non-swimmers, and a cowardly crew that sought their own escape first led to mayhem and death. The crisis was made worse by the captain’s refusal to bring the burning ship to shore, ostensibly to prevent the fire from spreading, and the unfortunate timing of the fire occurring while the boat was in Hell’s Gate’s notoriously rough waters. I won’t depress you with the full story here. I know from my 2009 blog about the war in Afghanistan that people don’t like reading sad blogs. Suffice to say that 1,021 people died either by fire or drowning that day, with only a few hundred surviving. The disaster also devastated the large German-American population on the Lower East Side. (Back then, the “East Village” was considered part of the LES.) Hundreds of families lost relatives that day, and some entire families were wiped out. The grief led to suicides and depression, and eventually the wholesale movement of the community out of the area. Many resettled on the Upper East Side, which retained a German-American flavor for many years. Those with a further interest in this story should read this New York Public Library piece, or listen to the Bowery Boys excellent podcast. The tragedy also created an unfortunate legacy for Henry Warner Slocum, who served with distinction alongside William Sherman as a major general for the Union during the Civil War. After the war he served as the rep from New York’s 42nd Congressional District (we now only have 27 districts) and lived in Brooklyn, where he is buried. On a more uplifting note, the idea of taking large groups of kids out of the projects to a more bucolic setting for the day is an excellent one. Sponsoring such large outings was once the hallmark of Tammany Hall, who would bring kids up the Hudson and serve them picnics in the park. While Tammany Hall’s motivations were obviously self-interested, hopefully someone else is inspired to do the same for kids who don’t get to see much beyond the concrete they’re born into. A boat ride to Bear Mountain sounds nice this time of year.